Trees , to 40(-50) m. Bark medium to dark gray or brownish, deeply split into narrow rough ridges. Twigs with distal edge of leaf scar notched, usually deeply, not bordered by well-defined band of pubescence; pith light brown. Terminal buds ovoid or subglobose, weakly flattened, 8-10 mm. 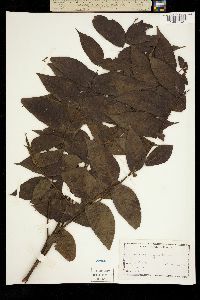 Leaves 20-60 cm; petiole 6.5-14 cm. Leaflets (9-)15-19(-23), lanceolate or ovate-lanceolate, symmetric or weakly falcate, (3-)6-15 × 1.5-5.5 cm, margins serrate, apex acuminate; surfaces abaxially with capitate-glandular hairs, simple or 2-rayed fasciculate hairs, and scales scattered over veins and blade, axils of proximal veins with prominent tufts of fasciculate hairs, adaxially glabrous except for scattered capitate-glandular and fasciculate hairs on midrib; terminal leaflet small or often absent. Staminate catkins 5-10 cm; stamens 17-50 per flower; pollen sacs 0.8-0.9 mm. Fruits 1-2, subglobose to globose, rarely ellipsoid, 3.5-8 cm, warty, with scales and capitate-glandular hairs; nuts subglobose to globose, rarely ellipsoid, 3-4 cm, very deeply longitudinally grooved, surface between grooves coarsely warty. 2 n = 32. Flowering spring (Apr-May). Rich woods; 0-1000 m; Ont. ; Ala., Ark., Conn., Del., D.C., Fla., Ga., Ill., Ind., Iowa, Kans., Ky., La., Md., Mass., Mich., Minn., Miss., Mo., Nebr., N.J., N.Y., N.C., Ohio, Okla., Pa., R.I., S.C., S.Dak., Tenn., Tex., Vt., Va., W.Va., Wis. Variation of Juglans nigra in central Texas and south-central Oklahoma should be studied; specimens seemingly intermediate between J . nigra and both J . major and J . microcarpa have been seen from this area. E. C. Twisselman (1967) incorrectly reported that J . nigra was locally naturalized in California; his specimens were all J . hindsii (possibly introgressed with J . nigra ) and J . californica . Juglans nigra is frequently cultivated as an ornamental, and the nuts are prized for their strong, distinctive flavor. Tree to 40 m tall, trunk 0.6 - 1.2 m in diameter Leaves: alternate, pinnately compound, 20 cm - 0.60 m long, with thirteen to 23 leaflets. Flowers: either male or female, found on the same tree (monoecious), male flowers borne in hanging catkins 5 - 12 cm long, female flowers (6 mm long) borne solitary or in small stalked clusters. Fruit: a nut surrounded by a husk 3.5 - 8 cm in diameter, borne solitary or in clusters of two or three. The husk is green, thick, and hairy. Nuts enclosed by a 3 - 4 cm long, spherical, longitudinally grooved, four-chambered shell. Bark: light brown and scaly when young, becoming deep brown to grayish black and deeply furrowed with rough ridges. Twigs: stout, brown and hairy, becoming dark and smooth. The center of a cut twig (pith) is chambered and cream-colored. Terminal buds: 6 - 8 mm long, egg-shaped, slightly flattened, hairy. Leaf scars: deeply notched at the top with three U-shaped vascular bundle scars. Leaflets: shiny yellowish green above, paler with a few soft hairs beneath, 5 - 15 cm long, 1.5 - 5.5 cm wide, oblong-egg-shaped to lance-shaped, irregularly toothed. Terminal leaflet is usually absent. Foliage is aromatic when crushed. Form: with straight and tall trunks in forest-grown trees, but with open and wide branching when given space. Similar species: The similar Juniperus cinerea typically has a terminal leaflet, lemon-shaped and sticky-haired fruit, light gray bark, dark brown pith, a long terminal bud, and the leaf scar looks like a monkey's face with hairs along the upper edge. Habitat and ecology: Upland savannas, oak-hickory forests, and low woods along stream terraces and creeks. This species is intolerant of very dry, acidic or wet areas. Due to the high value of the wood, it has become less frequent in the Chicago Region. Notes: The highly valuable wood of J. nigra is used for veneer, cabinets, furniture, interior trim, caskets, gunstocks, paneling, and bowls. The nut shells are used for polishing metal. Long-tailed luna moth caterpillars feed on the leaves. To protect itself from competition, roots of this species excrete a chemical, juglone, that is toxic to competitors growing up to 25 m from the tree. Etymology: Juglans comes from the Latin name for walnut, which is derived from the words jovis, meaning "of Jupiter," and glans, meaning acorn. Nigra comes from the Latin word for black, referring to the bark. This species is probably a native of every county of the state. It is infrequent but well distributed in all parts of the state where it will grow. It will grow almost anywhere and is a native in all kinds of soils except on the hills and in the flats of the southern part and on the sand hills of the northern part. It grew to a great size. A pioneer whose veracity was unquestioned, told me that a tree 8 feet in diameter was cut near Bluffton, and 60 feet of it was used as a "dugout" in which flour and other merchandise were transported on the Wabash River from Murray to Huntington. He said he knew of another walnut tree near Montpelier that was 9 feet in diameter. It must be remembered that I have no data as to the height above the ground at which these measurements were taken.